9-7-2010 Basics of Computer Design. Performance Measures. Instruction Set Architecture (ISA) Characteristics and Classifications. CISC vs. RISC, The MIPS64 ISA. 9-14-2010 Exploiting Instruction-Level Parallelism (ILP): Basic Instruction Block, Loop Unrolling. Further Classification of Instruction Dependencies: Dependency Analysis and Graphs. 9-21-2010 Dynamic Hardware-Based Instruction Pipeline Scheduling: The Scoreboard, The Tomasulo Approach. 9-28-2010 Fundamental Dynamic Hardware-Based Branch Prediction Techniques: Branch-Target Buffer (BTB), Single-level, Correlating Two-Level, Gshare, and Hybrid Dynamic Branch Predictors. 9-30-2010 Multiple Instruction Issue, CPI <1 Approaches: Superscalar, VLIW. Hardware-Based Speculation: Speculative Tomasulo. 10-12-2010 Data Parallelism & Loop-Level Parallelism (LLP) Analysis. GCD Test. Software Pipelining. FYI: Brief Introduction to Vector Processing. 10-14-2010 Review of Memory Hierarchy & Cache Basics (from 550). 3Cs of Cache Misses, Cache Write Strategies & Performance. Multi-Level Cache. 10-26-2010 Input/Output & System Performance Issues. 11-2-2010 The Memory Hierarchy: Main Memory Issues. Performance Metrics: Latency & Bandwidth. DRAM System Memory Generations. Basic Memory Bandwidth Improvement/Miss Penalty Reduction Techniques. Quizzes are announced one class in advance, and are given only during first 20-30 minutes of the specified class. Quizzes are closed references (e.g. no books, notes, handouts, etc...). Calculators will be helpful. There are no makeup quizzes and your lowest quiz grade is automatically excluded from the average calculation. A single all-inclusive 2-hour examination is given in week 10. Books, notes, quizzes and handouts are allowed in the exam. A calculator will be very helpful. 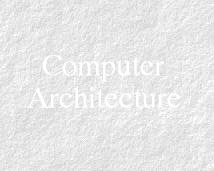 Students will select one partner from the class to research a significant topic in the field of Computer Architecture, write a report, and give a presentation. Each group�s topic must be presented and approved by Dr. Shaaban. Duplicate topics are not permitted and proposals are accepted on a first come first serve basis. The Paper: Each group will write a joint report (~ 6-8 pages) on their research using the IEEE journal format/guidelines/template. DO NOT CHANGE THE TEMPLATE! Take great care in following the guidelines, especially properly citing illustrations, graphs and quoting from their respective sources. The paper is due (hardcopy and electronic) at the beginning of the last day of the presentations. Late submissions will be significantly penalized. Plagiarism will result in a Zero ( see page 19 of the KGCOE 2010-2011 Student Handbook). Computer Architecture: A Quantitative Approach, Fourth Edition, John Hennessy, and David Patterson, Morgan Kaufmann Publishers, 2006. Computer, vol. 31, no. 6, pp. 33-43. June 1998. Micro, vol. 18, no. 4, pp. 60-75. July/Aug. 1998. Proc. 17th Annual IEEE Symposium on Computer Architecture, 1990, pp. 322-331. Proceedings of the IEEE 81(8):1151-1165, Aug., 1993. ACM Computing Surveys, Vol.26, No.2, June 1994, pp.145-185. Dept. of Electrical Engr. and Computer Science, University of Michigan, Technical Report, CSE-TR-200-94, 1994. Proc. 1995 ACM SIGMETRICS Conference on Measurement and Modeling of Computer Systems, pp.136---145, May 1995. Vector Processors, PDF, Appendix G, Computer Architecture: A Quantitative Approach, Third Edition. Christoforos E. Kozyrakis et al. IEEE Computer Special Issue: Future Microprocessors - How to use a Billion Transistors, September 1997. Week1: Fundamentals of Computer Architecture Design, Performance Measures Review. Instruction Set Principles Review and Examples. CISC vs. RISC. A Typical RISC Example: The MIPS64 Architecture. Week9: Introduction to parallel processing and multiprocessor system architecture. This page is 30Kbytes long and was last modified on: Tuesday, 09-Nov-2010 00:04:30 EST.